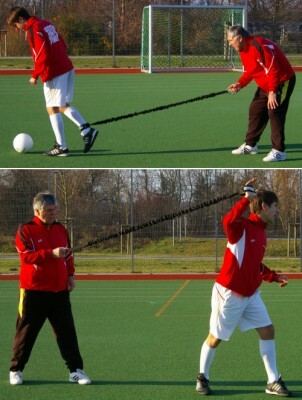 Modern training equipment from a kind of bungee rubber for optimum arm, leg, leg, shot and power training. The athlete connects the leg holder and secures the stable carabiner on the other side on a fence or goalpost or keeps it in his hand. Now an optimum resistance (bungee effect) is achieved by the tension of the bungee cord, which allows a professional arm, leg or shot power training. To train shooting power, you can work with a ball. As seen in the pictures, this device can also be used for the training of arm and throwing power. Through the stable carabiner at the end of the cord, also an athlete by his own can work with the device. Simply connect the power carabiner to a the fence or goalpost and get started. The power-bungee cord allows the athlete to work with optimal resistance to achieve an enormous training effect. It can be used in several sports. You get a power cord incl. foot or arm clip and large carabiner for holding or fixing. Also coaches from the professional sports work with our training supports. The matching application exercises can be found in our training card system and DVD, more power belts in our shop.